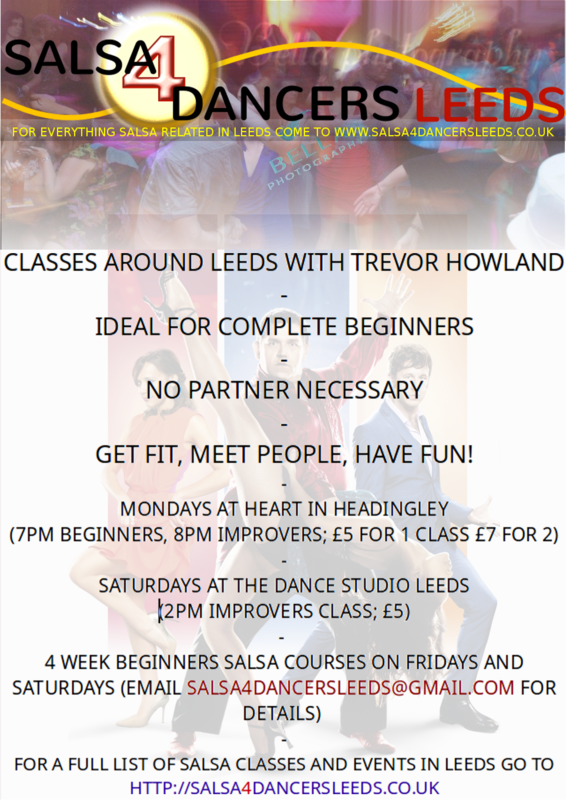 Home › Beginners › Christmas message, and New Year Salsa Plans! Christmas message, and New Year Salsa Plans! It is a while since I’ve written a post, but I have so much news for the 2015 that I thought that this would be the best way to let people know! For a start it is coming up to 1 year since I was running my Beginners salsa courses in the Dance Studio Leeds on Saturdays. The classes are going great, and I’ve already got people signed up into 2015! Alongside my regulars (thanks guys), the classes are bustling, and I have added an Improvers class each Saturday at 2pm! The Beginners course is by advance booking only, but the Improvers class is open to anyone that is at a sufficient level! The Beginners course is £30, or £25 for the concessionary rate. The Improvers class is £5 per class! In addition to this I am starting a new class in Heart in Headingley in the New Year. Heart is a community center in the ‘heart’ of Headingley. It has a great cafe, a licensed bar, and a fantastic dance floor! The classes are on a Monday and will be at Beginners and Improvers level at first. The classes will be on a Monday, with the Beginners at 7pm and the Improvers class at 8pm. One class will be £5 or do both for £7! Finally I am going to be teaching a Beginners course at Different Class in Morley! This course is by advance booking only, and I will be taking a select group all the way from ‘never danced salsa’, to as far as they want to go! The classes will be for 2 hours every Friday from 7pm. If you want to get in on this at the start, then the course starts on the 9th January, and will come in 4 week blocks. The price for each block will be £30. This course is open to couples only, to maintain equal numbers of leaders and followers. Even further ahead I’m looking to bring a big name to Leeds to teach some classes and workshops… I won’t say too much at this stage as I’m still trying to firm up the details, but when I know for sure you’ll find out for sure! I’m excited already! So, here’s wishing you a very Merry Christmas, and a Happy New Year! ‹ My name is Trev, and I’m a Salsaholic!